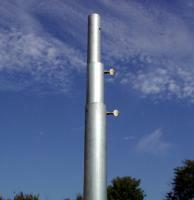 ground socket into the ground and pole sections connected and tighten the flange to the pole system. 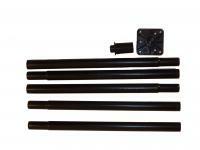 Use this pole kit package to mount a large or medium bird feeder on a pole. Package includes a 3-section heavy duty 16 gauge wall, 1" diameter black steel tubing, a ground socket that sinks into the ground 20", a black 14-1/2" cylindrical squirrel baffle and a flat topped mounting flange. Holds 1 bird feeder on the pole. 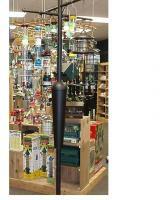 • 14" pole section with one swedge which extends to 12"
• 22" pole section with one swedge which extends to 20"